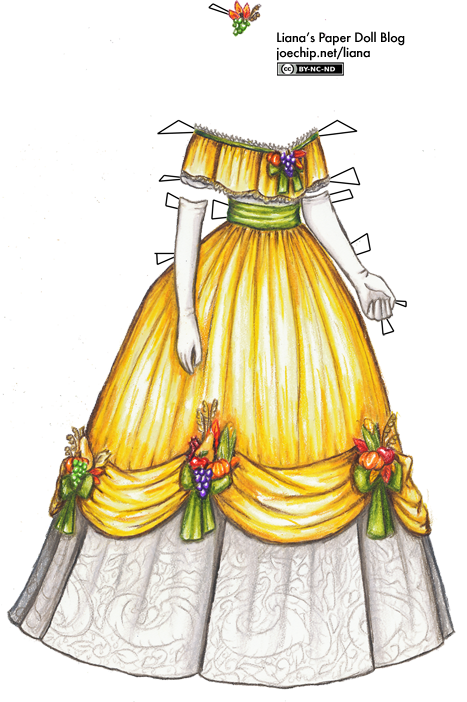 In 1863, Abraham Lincoln proclaimed a national Thanksgiving Day, so for today’s dress I have an 1860s-style ball gown with harvest motifs. I hope you like it, even if you’re not celebrating Thanksgiving today! Why not — silly poll time! I absolutely adore this dress! Everything Liana does is awesome! She’s so creative. COOl, i’m second. HOW DO YOU THINK OF THESE AMAZING DRESSES?????????????? When’s the next contest, BTW? This is a great dress! I don’t celebrate Thanksgiving because I live in New Zealand. I do have a friend from America though who is having her annual Thanksgiving dinner, and I get to go to that for the first time this year! Yay Liana your back and with really pretty new dresses!! You could (in the column) include all the colors of the dress that you used and your inspiraition of the dress. P.s. I LOVE this dress. It’s so foody. Will you please, for december, do a dress for 12 or whatever days of christmas. I think it’s the 12 days of christmas. I like the cornucopia pattern in the underskirt. Indeed, thanks for posting on this lovely holiday-day!! I love the themed dress (I noticed the cornucopia design on the skirt too and it made me happy :D) I’m glad you could enjoy the day with your extended family!! For Thanksgiving dessert, it’s gotta be pumpkin pie! This year my aunt made two! amazing desserts (a vanilla/pumpkin ice cream cake with cranberry sauce and a meringue with raspberries and an almond spread) in addition to the traditional pie my mum brought. All three were incredibly delicious. It’s fun to try new things, but I’ll never get tired of the simple, yummy pumpkin pie. I’m an American living in Asia, but we still try to celebrate Thanksgiving, though not usually on the actual day. My favorite dessert is cherry pie with whipped cream…Yum!! Thanks for the gorgeous dress. Awesome. Just, awesome. This dress is on an awesome level up there with chocolate and Harrison Ford. What makes it that awesome? The cornucopia pattern in the underskirt. As for dessert… pumpkin pie, duh! See, I don’t hold with all these other pies for thanksgiving. Cherry pies, or anything with berries, are for summer. So are apple and peach pies. Mango pie can be for anytime because it’s mango. So can chocolate. Pumpkin is the only proper pie for Thanksgiving, that’s all there is to it. I agree with Sara–an awesome dress! That subtle cornucopia pattern is brilliant. So creative! That is what makes you an artist–I could never in a hundred years have thought of that! I love pie–apple and especially pumpkin for Thanksgiving; I made 5 kinds this year. Your husband does not DESERVE baklava if he doesn’t understand that there is no such thing as bad, ugly, or disappointing baklava–it is food of the gods and it is ALL good! Wow! A real live editor asking for one of your paper dolls??? I so want to get this magazine! beautiful detail Liana! I love it! To Faseeha: If anyone voted “I dislike desserts” the ceiling would fall on their heads or something. That’s just heretical!